The family's kit. Easy to set up, with a 5cm wide webbing. 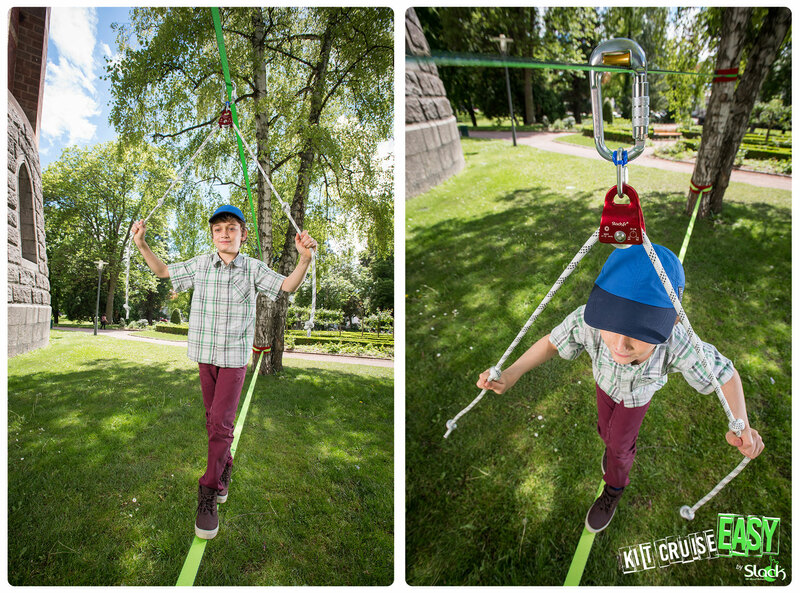 This slackline kit is perfect for beginners (children, family use) who wants to discover the feeling of slacklining. Even for a leisure use, this slackline kit allows you to jump on it. It is made for an easy learning of slacklining. Only 2 elements for a simple setup. The 5cm webbing allows a simple approach. Set it up very low for the children (knee level). You can add the Easy Pack as an option. This is a pack consisting of a guideline to install above the Kit Cruise to help find balance and therefore take more fun ! Thanks to the Easy Pack, the fun side comes back to the fore. It consists of a 2.5cm wide webbing and 15m long, with loop. It setup over the slackline to make a guideline. You will have the necessary help to be able to evolve on the whole of the slackline from your first steps. The guideline being guided but mobile, you will be helped while working your balance. Thanks to our hanging system, it stays in place and at the place even during falls. The set-up is easy and intuitive. It can support the weight of an adult without any problem. Protect both tree and equipments. 15m of webbing 2,5cm wide (black or orange available stock). With eyeloop.